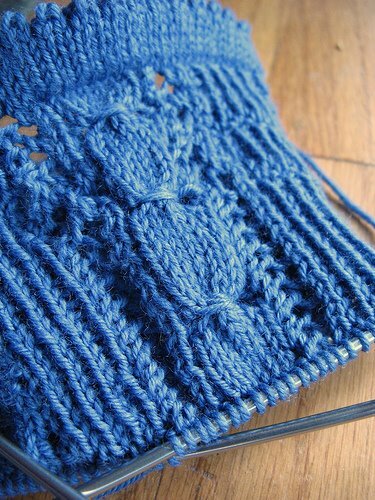 In addition to the blue lace sock, I started a cable sock. I was so excited to start my first cable project that I didn’t bother thinking about the size I was making. I just made small by default. I tried it on after I had completed a significant portion of the sock and it is super tight on me, so it’s not really going to fit anyone. I’ve put it on the back burner for the moment, but this is just one warm up for the holey grail of knitting projects that I am going to attempt. Ysolda designs absolutely beautiful knitted clothes. She designed this zip up hoodie that is loaded with cables. It is exquisite. Here’s a link to a picture of her wearing her own design http://ysolda.com/wordpress/readerknits/groups/tags/twist/photo/3027681767/vivian.html. And finally, go for it and be prepared to exercise immense patience! It’s been a while since my last post, but I haven’t been idly standing by. Oh no, I’ve been busily knitting and learning new and cool techniques and stitches. 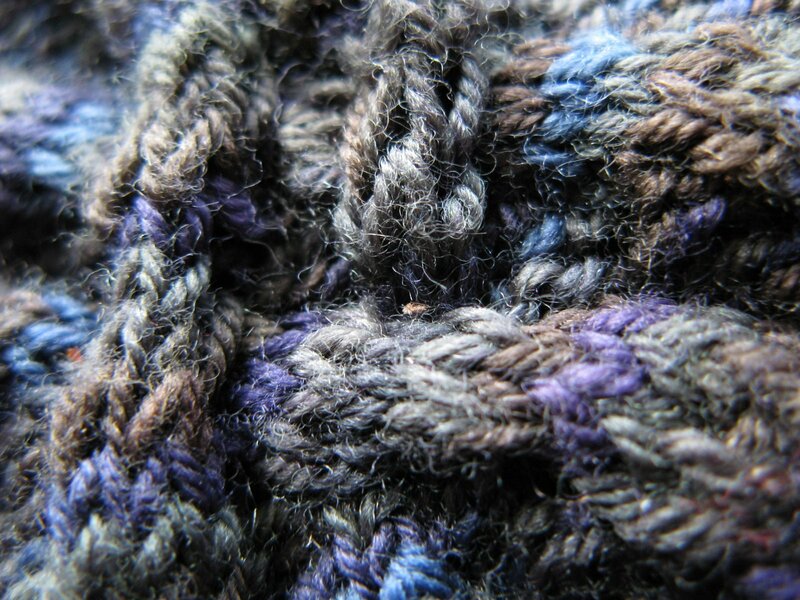 This picture above is the top of a new lacy sock I’m working on. This edge is called a Picot Edge and is basically made up of 5 rows of stockinette then *K2Tog, YO, repeat from *, then 5 more rows of stockinette. 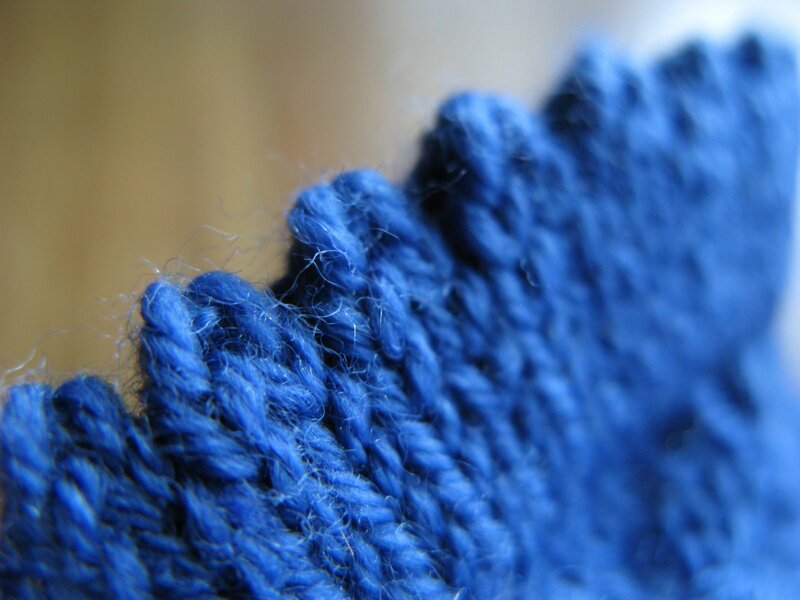 Then the magic happens… you fold it over and pick up the back stitch from the cast on row and knit it together with the stitches on the needle and ~TA DA~ you have this dainty little finished Picot Edge. Very feminine. I had to do this twice to get it right and there is still room for improvement. 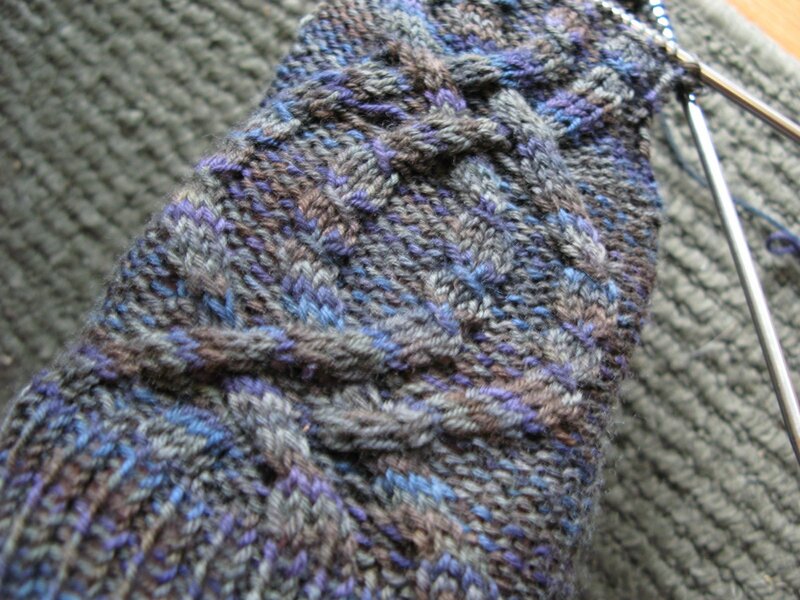 This sock also has a mock-cable twist that adds a nice detail without needing to use a cable needle. It’s a very girlie-girl sock for sure. As you can see clearly, I had a lot of trouble with this pattern for the first 20 rows or so, but I’m finally starting to get the hang of it and can knit it without needing to reference the pattern. It’s slow going, but a turning into a really pretty sock. I wasn’t sharing it with the work because I was going to give it to my sister-in-law, but it’s too messy to give away. I’ll have to keep it and do another set once I’ve really mastered it. The pattern is in the 2-at-a-time Socks book by Melissa Morgan-Oaks. I am obviously not doing it on a circular needle, 2 at-a-time. I tried… it’s just too much of a pain to constantly be pushing the stitches onto the proper needle while keeping the 2nd sock on the wire. Maybe when I get super good I’ll try it again, but so far I really enjoy working with the double point needles 1 at a time. I really love Melissa’s patterns though! !